Now, the high school student helps connect her peers to each other with compassion, and lets people know that their words and actions matter. “I want to show my peers that they are not alone, and that there is help out there. Just because they may feel like no one may understand them, or what they may be going through, there is someone out there that does,” Grace said. Grace spoke about what she went through to the 1,000 people who attended the first Speak Up, Stand Up and Save a Life conference last year. She and her family also will take part in the second annual conference to be held January 16 at Grand Canyon University that 5,000 people are registered for. Connecting students struggling with bullying, depression, mental illness, suicidal thoughts or other challenges with the support and resources they need is the main focus of the conference created by Dr. Lily Matos DeBlieux, superintendent of Pendergast Elementary School District, with help from Gina Godbehere, an attorney with the community-based prosecution division of the Maricopa County Attorney’s Office, and Jennifer Rogers, a strategic development expert for GCON Inc.
“These resources saved our child’s life,” said Johnny and Yoly Martinez, Grace’s parents. Families need to know that the help is more important than the stigma that surrounds mental health issues, Yoly Martinez said. The conference was developed in response to the deaths of two teenage girls in a murder-suicide in 2016 at a high school in the West Valley, said Godbehere, who was called to the scene as part of her job and was deeply saddened by the tragedy. The week after the girls’ deaths, a chief of police panel discussed the incident at the Leadership West alumni group that DeBlieux, Godbehere and Rogers are a part of, saying that in almost every school tragedy there were warning signs on social media that were missed, either because they were not taken seriously or no one wanted to get a friend in trouble, Godbehere said. “We had a choice to sit back and do nothing or to try to prevent a future tragedy by empowering our youth to report concerning posts and other concerning incidents to law enforcement, parents or school representatives,” Godbehere said. So they developed this conference that gets together kids, parents, teachers, police officers, administrators, businesses and non-profits to find solutions. The need to do something is clear. 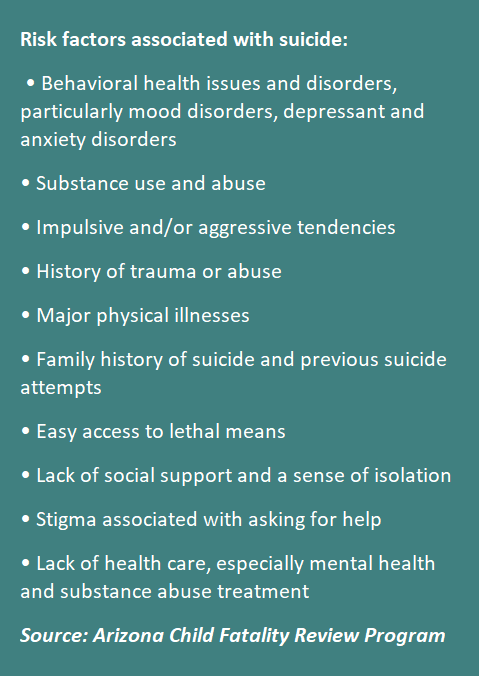 In 2015, 47 Arizona children killed themselves, an 81 percent increase in suicide since 2009, according to the Arizona Child Fatality Review Program’s annual report. “In Arizona, much like the rest of the country, student deaths from suicide have increased exponentially, and many youth-related deaths have been found to be preventable if people would get involved and schools went the extra mile to provide the tools to make a difference,” said DeBlieux. Youth motivational speaker Jeremy Anderson will be the conference’s keynote speaker. Then students will attend breakout sessions led by youth facilitators while parents, counselors, guests, and law enforcement will take part in separate breakout sessions on mental health, suicide and bullying where they will hear from Erin Callinan, the author of Beautifully Bipolar, LeAnn Hull from the Andy Hull’s Sunshine Foundation, and R. Bradley Snyder from the Dion Initiative. Afterwards youth and adults will return to the arena for the closing session. The conference is free of charge for participants thanks to Grand Canyon University, the Maricopa County Attorney’s Office, GCON, INC. and the Pendergast School District as well as many other sponsors and supporters. Each school that attended the conference developed an age-appropriate, measurable action plan to make a difference for their students, DeBlieux said. These student-led initiatives are key to making a difference. At Canyon Breeze Elementary School in the Pendergast School District, eighth-grade students created posters and displayed them in classroom hallways, the front office, cafeteria, library and gym. Students researched and brainstormed a shared message that was delivered in classrooms for all grade levels, then students visited a variety of third- through eighth-grade classrooms to share their thoughts, ideas and solutions. “They reviewed key vocabulary associated with bullying and provided examples and narratives to make student connections and bring understanding, awareness and empathy,” DeBlieux said. The Student Council president and National Junior Honor Society president presented their thoughts, ideas and action steps at a board meeting hosted at Canyon Breeze on February 21, 2017. Then the eighth-grade team met with seventh-graders to share current project details to ensure a smooth transition of responsibility for the 2017-18 school year. “They will incorporate a student survey at the beginning of the year and continue with posters, a kick-off assembly, anonymous bully box, and continue with classroom visits,” DeBlieux said. At Sonoran Sky School, the student leadership group completed service projects for people on campus and visited each classroom where they spoke to all students about the importance of reporting bullying and avoiding anything that could hurt another person. “We have heard from many students that their involvement has helped students face their issues and have felt empowered to share with a caring adult or parent to assist them,” De Blieux said. Several parent nights after the conference will connect families with resources in their communities. The resource nights are scheduled for Jan. 31, Feb. 6 and Feb. 13 at times and locations throughout the Phoenix metropolitan area that will be announced on the speakupstandupsavealife.com website, Godbehere said. Topics will include suicide and depression, drug addiction, mental health, eating disorders and bullying. While the conference initially was for Maricopa County schools, there has been demand from schools in other counties and especially from rural areas, Godbehere said. Schools in Native American nations have asked to attend the conference, and law enforcement from Yavapai County and Apache Junction will attend the conference this year. There are discussions with the National Alliance on Mental Illness of Southern Arizona and other county attorney’s offices around the state to bring this type of event to other areas of the state over time, Godbehere said. The post Students and community members urged to Speak Up, Stand Up and Save a Life appeared first on AZEdNews.